A financial scandal is threatening French President Francois Hollande, after it emerged that his former Socialist Party treasurer invested in two Cayman Islands offshore companies. Jean-Jacques Augier, who managed Mr Hollande's campaign funds, told the daily Le Monde that there was "nothing illegal" in his tax haven affairs. Meanwhile, ex-budget minister Jerome Cahuzac has been charged with fraud. Ministers are under pressure to reveal what they knew about his tax evasion. Speaking during a two-day visit to Morocco, Mr Hollande insisted he knew "nothing" about the "private activities" of Mr Augier. 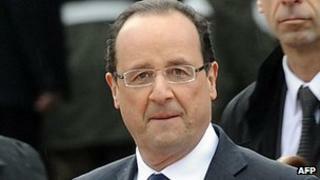 He said it was up to France's tax authorities to investigate the matter, AFP reported. The Cayman Islands revelations came out in a global investigation by reporters, including Le Monde, into secret offshore accounts. It was co-ordinated by the International Consortium of Investigative Journalists. On Wednesday President Hollande used a national address to promise that in future all ministers and MPs would have to declare fully their personal finances. But the media is already questioning whether that is enough, the BBC's Christian Fraser reports from Paris. The pressure is growing for a full government reshuffle - just 10 months after Mr Hollande took office. Mr Cahuzac admitted this week that he had hidden about 600,000 euros (£509,000; $770,000) in a Swiss bank account. French newspapers are calling it the biggest political crisis for Mr Hollande since his election last year, the AFP news agency reports. He had promised voters morality and integrity in public life after what were nicknamed the "bling-bling" years of his conservative predecessor Nicolas Sarkozy. But this year Mr Hollande's opinion poll ratings have slumped, as the country remains mired in recession and unemployment at 10.6%. In the latest financial twist, Le Monde reports that Mr Hollande's ex-treasurer Jean-Jacques Augier became a shareholder in a Cayman Islands company called International Bookstores Ltd in 2005. He said that venture came about because of a large publishing investment in China. He insisted that he had "no personal bank account in the Caymans nor any direct personal investment in that territory". But Mr Hollande's administration has been chasing the wealthy with such investments abroad, our correspondent says. So Mr Augier's affairs are a problem for him. Earlier this week it emerged that the former budget minister, Mr Cahuzac, had lied to the president, parliament and the public about the offshore accounts he had held for more than 20 years.